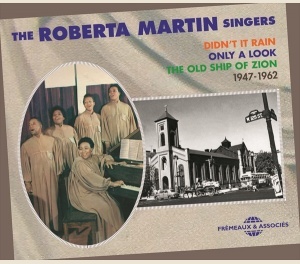 GOSPEL - THE ROBERTA MARTIN SINGERS - ANTHOLOGY 1947-1962 - FA5737 – Frémeaux & Associés. CD1 (1947-1952) : PRECIOUS MEMORIES • LISTEN TO THE RAIN (DIDN’T IT RAIN • YIELD NOT TO TEMPTATION • HE IS ALL I NEED • NO NO, NOTHING CAN CHANGE ME • OH, SAY SO • JESUS • ONLY A LOOK • HE KNOWS HOW MUCH YOU CAN BEAR • THE OLD SHIP OF ZION • DO YOU KNOW HIM • MY ETERNAL HOME • WHAT A FRIEND • SATISFIED • TELL JESUS ALL • WHERE CAN I GO • THE LORD WILL MAKE A WAY • I WANNA SEE JESUS • I’M SEALED • OH! LORD STAND BY ME • HE DIDN’T MIND DYING • HE’S ALWAYS RIGHT THERE • AFTER IT’S ALL OVER • I’M DETERMINED. 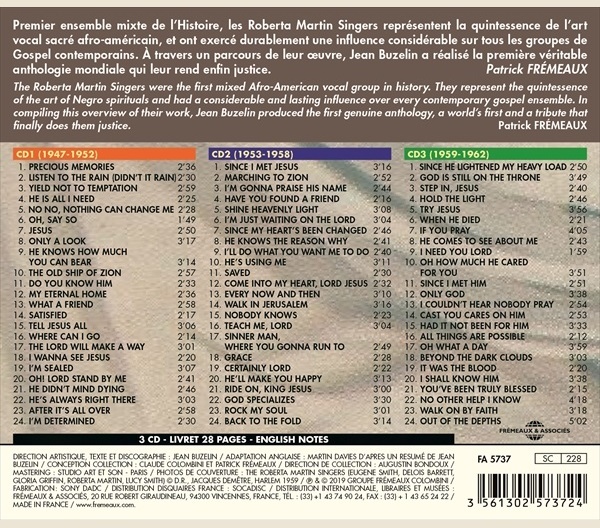 CD2 (1953-1958) : SINCE I MET JESUS • MARCHING TO ZION • I’M GONNA PRAISE HIS NAME • HAVE YOU FOUND A FRIEND • SHINE HEAVENLY LIGHT • I’M JUST WAITING ON THE LORD • SINCE MY HEART’S BEEN CHANGED • HE KNOWS THE REASON WHY • I’LL DO WHAT YOU WANT ME TO DO • HE’S USING ME • SAVED • COME INTO MY HEART, LORD JESUS • EVERY NOW AND THEN • WALK IN JERUSALEM • NOBODY KNOWS • TEACH ME, LORD • SINNER MAN, WHERE YOU GONNA RUN TO • GRACE • CERTAINLY LORD • HE’LL MAKE YOU HAPPY • RIDE ON, KING JESUS • GOD SPECIALIZES • ROCK MY SOUL • BACK TO THE FOLD. CD3 (1959-1962) : SINCE HE LIGHTENED MY HEAVY LOAD • GOD IS STILL ON THE THRONE • STEP IN, JESUS • HOLD THE LIGHT • TRY JESUS • WHEN HE DIED • IF YOU PRAY • HE COMES TO SEE ABOUT ME • I NEED YOU LORD • OH HOW MUCH HE CARED FOR YOU • SINCE I MET HIM • ONLY GOD • I COULDN’T HEAR NOBODY PRAY • CAST YOU CARES ON HIM • HAD IT NOT BEEN FOR HIM • ALL THINGS ARE POSSIBLE • OH WHAT A DAY • BEYOND THE DARK CLOUDS • IT WAS THE BLOOD • I SHALL KNOW HIM • YOU’VE BEEN TRULY BLESSED • NO OTHER HELP I KNOW • WALK ON BY FAITH • OUT OF THE DEPTHS.